When you come to SWD Essex Windows and Doors, you can benefit from our excellent finance package which helps spread the cost of your home improvement project and allows you to enjoy a new and improved property sooner rather than later. If you’re looking for double glazing finance and you have bad credit, it might well be that you’re unable to take out a substantial loan to cover the costs of a project. This is why our finance package is so useful as you can enjoy the updates to your home without the worry of requiring a large upfront cost. Our finance package offers a flexible and affordable solution for all homeowners with the ability to tailor your payment plan to fit within your living costs and lifestyle. If you have experienced being turned away from getting a loan for your home improvements or you have bad credit, our double-glazing finance package can help. If you don’t have access to savings or a lump sum, paying in easy instalments with a well set out payment plan helps achieve an easy way to reach your home improvement goals without the need for a large loan. You have complete control of the term and interest paid when you join our double-glazing finance scheme, even when you have bad credit. We are completely transparent when it comes to the details involved and there are absolutely no hidden fees. We believe that all homeowners should be able to enjoy brand new double glazing for their home. *Credit is subject to status. Current rates as at February 2018. Before undertaking work on your home, you’ll need to assess what work you’d like carried out on your home and what you want your home improvement project to achieve. 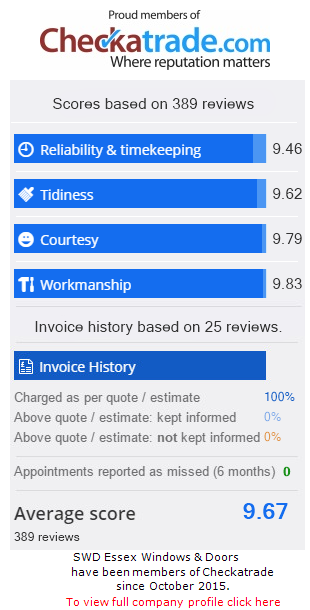 Once you have had a good look through our window, door, conservatories and roofline options, you can get a personalised quote in an instant. SWD Essex Windows and Doors can offer you a double-glazing finance option that means that you can improve your home right away and pay later. When it comes to larger purchases, our double-glazing finance scheme is an excellent option that is suitable for almost any homeowner. What Could you use your Double Glazing Finance for? We’re experts in the home improvement industry with a large range of products available to create the perfect solution for your property. You can use our double-glazing finance scheme to fund renovations to your home including updating the windows and doors, adding a conservatory, replacing your conservatory roof and upgrading your roofline. Depending on what you’re aiming to achieve, from extending your home, enhancing the aesthetic or transforming the entire look and feel, SWD Essex can help. Choose from a range of window designs such as stunning casements, sturdy durable composite doors with authentic timber look, luxurious roof lanterns to increase natural light and lots more. We have years of knowledge and experience in the home improvement industry so that you’ll be confident that you can entrust your property updates to a company that is passionate about a good result every time. Our double-glazing finance scheme will help get your project off of the ground and enable you to make your ‘dream’ home a reality. Our double glazing finance is controlled by you, so you can set how long you want it for and how much you want to pay back a month. We offer 12 months interest free allowing you to embark on your project without the worry of debt building up over the year. We are happy to answer any questions or queries that you may have either about our double glazing finance with bad credit or if you want more information about any of our products.